The Culver City Unified School District ("District") is requesting qualified persons, firms, partnerships, corporations, associations, or professional organizations to provide comprehensive and professional program management services to the District for new construction, expansion, modernization, and/or renovation projects relating to the District’s facilities development of its public schools. ("Project(s)"). Please click here for a copy of the RFQ/P document. Please click here for responses to common questions. All responses are due by 2:00PM on November 18, 2014. Culver City USD is soliciting bids for custom outdoor bins for compost, recycling and landfill trash for Culver City High School and Culver City Middle School. Please click here for a copy of the Bid document. All responses are due by 10:00AM on September 26, 2014. See Bid for complete instructions. Culver City USD is requesting proposals for health and benefits plan coverage for its District employees. Please click here for a copy of the RFP document and here for Addendum 1 issued 6/19/14. All responses are due by 2:00PM on July 31, 2014. See RFP for complete instructions. Culver City USD is requesting qualified persons, firms, partnerships or corporations to provide recycling program coordination services. Please click here for a copy of the revised RFP document issued 6/19/14 and here for Addendum 1 issued 5/23/14. All responses are due by 2:00PM on July 31, 2014. See RFP documents for complete instructions. Culver City USD is requesting qualified persons, firms, partnerships, or corporations to provide election consultant services to the District for a possible June 3, 2014 or subsequent bond election. Please click here for a copy of the RFP document. To see a copy of the District's Independent Contractor Agreement, please click here. On behalf of the South Bay Purchasing Cooperative (SBPC), notice is hereby given that Hawthorne School District will accept bids on or before 1:00 p.m., May 20th, 2013 for paper products, for the National School Lunch Program. The SBPC is composed of the following Districts: Palos Verdes Peninsula USD, Torrance USD, Hawthorne SD, Lawndale ESD, Manhattan Beach USD, Lennox ESD, Culver City USD, Santa Monica-Malibu USD, and Glendale USD. Please click here for a copy of the full bid notice. Culver City USD is requesting qualified persons, firms, partnerships, or corporations to provide election consultant services to the District for a possible November 2013 or subsequent bond election. *Because of a mixup with FedEx deliveries, if your proposal was not delivered by the March 29 deadline but was picked up by a delivery service before then, we will accept it. If we did not receive your proposal, please resubmit it along with a receipt showing pickup by a delivery service before March 29. 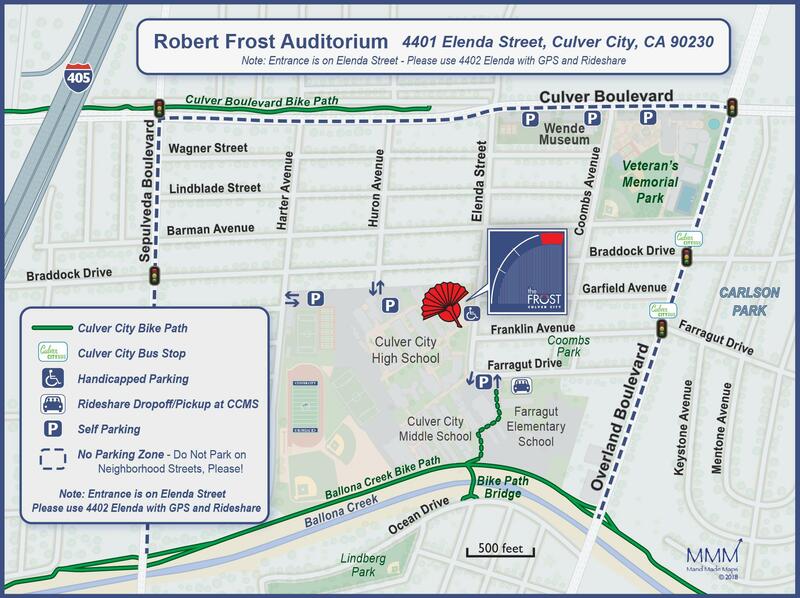 Culver City USD is requesting qualified firms, partnerships, corporations, associations, or professional organizations to provide an architectural and engineering feasibility study of Robert Frost Auditorium. Culver City USD is requesting qualified persons, firms, partnerships, corporations, associations, or professional organizations to provide comprehensive construction management services to the District, initially for the construction of an athletic field project and a solar project. All responses are due by 2:00PM on Friday, July 20, 2012. See RFP for complete instructions. Culver City Unified School District is seeking qualified firms to provide hazardous material surveying, testing and on-site observations at District facilities. All responses are due by 4:00PM on Thursday, June 15, 2012. See RFP for complete instructions. A Request for Proposal (RFP) has been issued by Culver City Unified School District to identify and select the most qualified turnkey photovoltaic system design-build supplier/contractor for the design, Division of State Architect (DSA) approval, installation, operation, and maintenance of one (1) "grid-connected" PV system expected to aggregate 750 AC kW. Q: Is the prevailing wage requirement mandatory? Q: Are the three DSA-approved projects mandatory? Q. Where is the meter history for all the sites? proposed system will be connected to the one meter only listed on the RFP. Q. Can you please provide the roof age and type? Q. Do you have a sample Non-Collusion Affidavit that we can use as Attachment A in our proposal? Q. Can I obtain a list of contractors that participated in the 5/6/11 job walk? Q. Are electrical line drawings available for the main campus?